Crazy about Japanese food? Feast your eyes and stomach on the grand display of fresh delicacies at the Wansui Japanese Seafood Buffet. 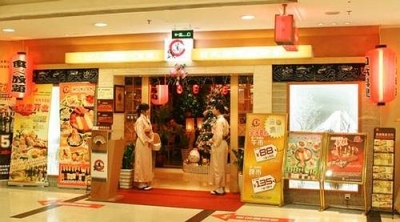 The restaurant is located in Hengbao Plaza, near Shangxiajiu Pedestrian Street. For a limited price, patrons can enjoy an extensive buffet of Japanese cuisine. "Wansui," is now the largest Japanese restaurant in Guangzhou with an area of more than 1000 m². The restaurant décor is traditional Japanese style, providing guests with a comfortable and well-suited environment. The "all-you-can-eat" lunch/dinner buffet (offer holds two hour time limit) has become their ticket to success. Over 500 mouth-watering Japanese dishes are offered, including sashimi, sushi, Japanese tappasaki, and tempura. You can also select your preferred libation from an impressive list of Sake, wine, beer and liquor. Dine on your birthday with three friends and receive one free meal. Buy three, get one free! You can also get a free birthday cake by showing your I.D. card on your birthday. For birthday celebrations and large groups, keep in mind that booking in advance is a must!